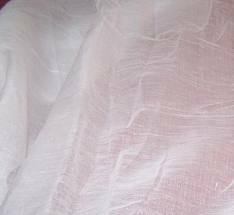 100% pure gauze cotton . Light in weight, soft and see-through. Mostly used in skirts, dupattas, cotton saris and for tie-dye prints. Bandhani. Machine washable (but expect 5% shrinkage on first wash). Colors will be slowly lost through successive washes.